I had a pair of layouts go up on the American Crafts blog yesterday featuring our furry friends! Journaling says: Despite what you see in these pictures, Rachel and Joey rarely get along, in fact, they usually just ignore each other. But, once in a blue moon they forget their difference and decide to snuggle together on their favorite shared space: the couch. I have to take pictures stat because these sweet moments don't last for very long! Love them! How to: Die cut the starburst frame from scrap cardstock (I enlarged it so it would cover an entire 12x12 square page) and then I designed a "love" heart in Adobe Illustrator and cut it from white cardstock. Next, trace every other starburst onto patterned paper, cut it out, and adhere it on a white cardstock background. Use the between scraps as spacers then remove all the spaces. Sew down each patterned paper strip. Adhere the heart die cut on top and sew it in place. Use a sharp craft knife to cut away in the inside of the heart then replace it with a cream patterned paper. 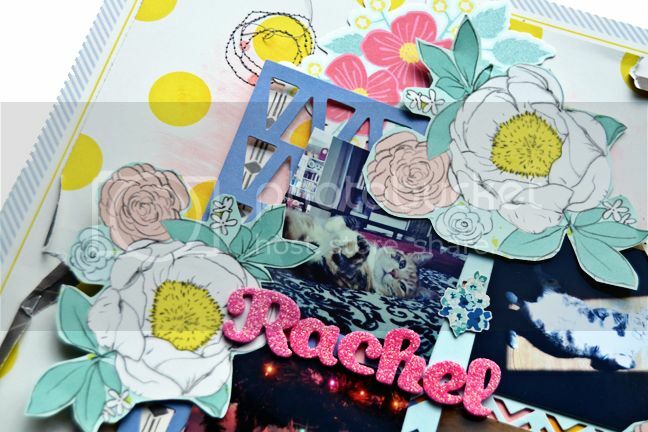 Add photos and embellishments as shown. Drop dark gray spray mist over the top left and bottom right corners. Journal between two of the rays. Journaling says: I love love love my kitty cat Rachel. She's the nicest, sweetest, and best cat ever! How to: Use pink watercolors to paint across the center of a 11" piece of yellow polka dot paper and let it dry. Stitch circles using gray thread over some of the polka dots. Staple the painted/stitched paper onto patterned paper with a gray striped border. Tear the edges of the polka dot paper and staple the torn sections. Fussy cut flowers from patterned paper. 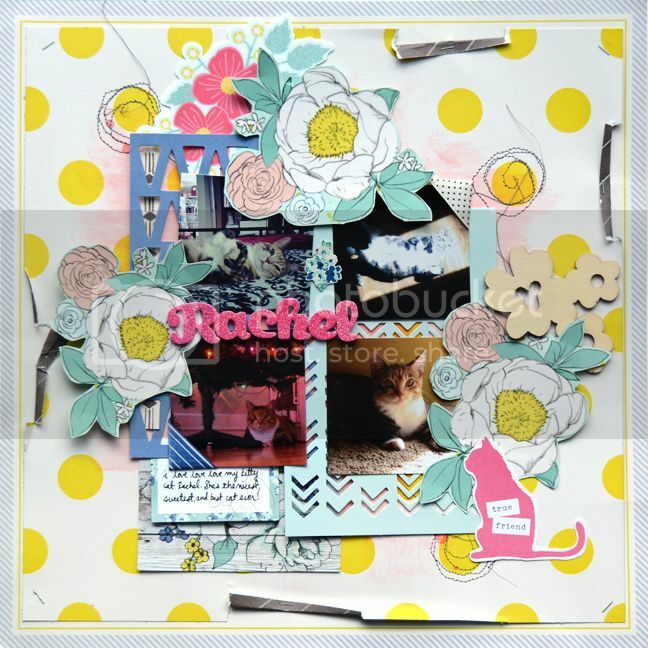 Layer die cut cards, four photos, and the fussy cut flowers on the center of the layout. 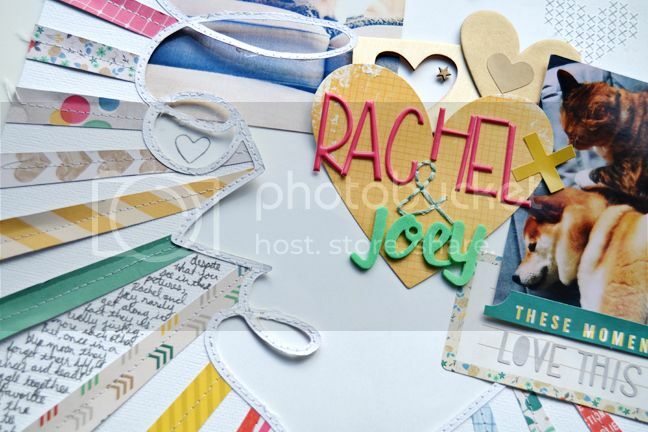 Embellish the layout with wood veneer flowers, a cat die cut, journaling spot die cut (with journaling written on it), a flower sticker, ribbon photo corners, and a letter stickers title as shown. Wow... I loved this pages... Very beautiful! These are gorgeous!! LOVING that "love" heart on the first one!!!! How adorable. We have a dog and a cat also, but both are the same size and they like each other. And sometimes they lay next to each other just like yours. I just posted a Picture on my blog also, but your layout is a good idea. Lovin' it. 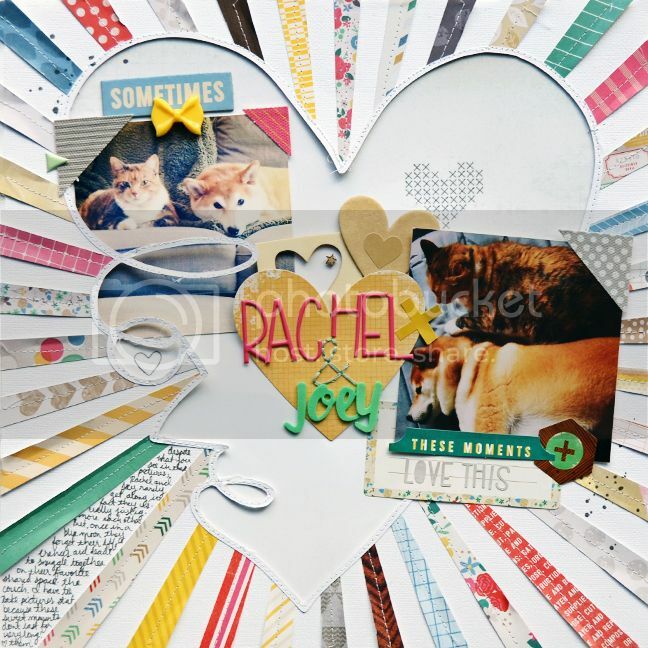 Awesome layouts to document the family pets, Paige!! Great pictures! Even better execution! Love these! What breed is your dog? He's adorable!